I can’t pretend to lie, cleaning is not my most favorite pastime in the world. We chose not to live in an enormous house so it’s not that difficult to clean but I just don’t prioritize it and would rather be working than cleaning. And the secret is to keep on top of things. Easier said than done right?! 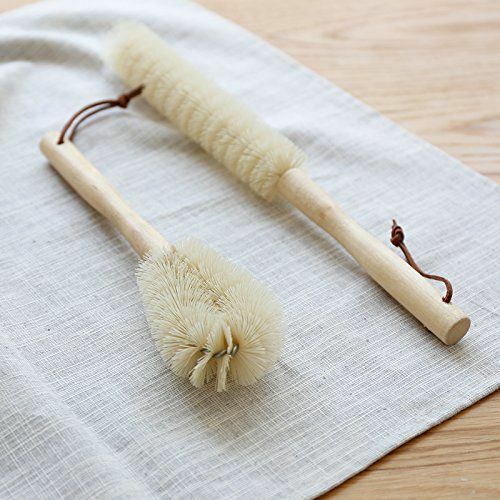 But there are huge benefits of keeping a clean and tidy house, not least that you will be able to find things more easily and have people over. You know that old saying “CHAOS = Can’t have Anyone Over Syndrome”! Well let’s get that fixed for you. 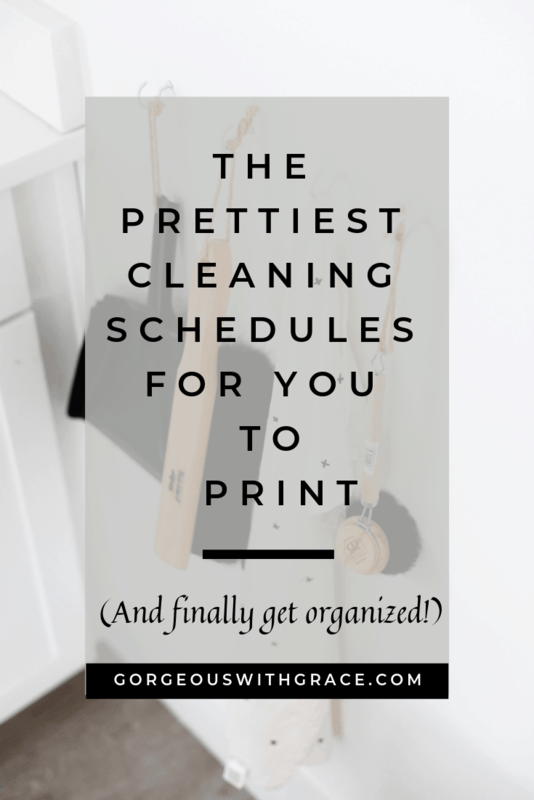 So if you are like me and have lots of good intentions and need a little reminder on a daily basis, I’ve rounded up the prettiest printables that will coordinate with any decor and look lovely pinned up on a board or a refrigerator. I love the whimsical notion of this printable. 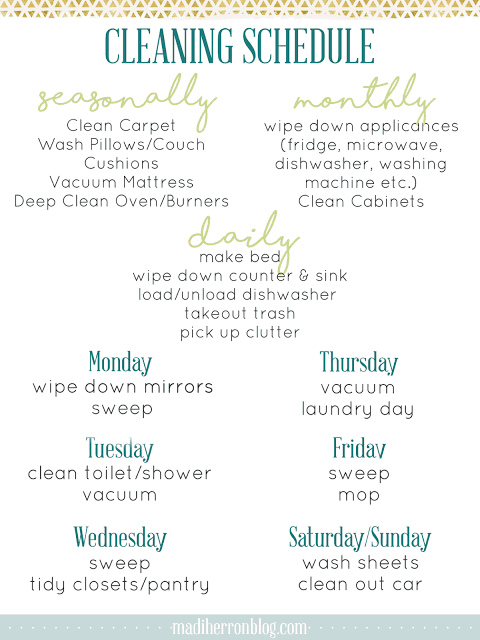 I especially love the fact that it is called a Weekly Cleaning Rhythm instead of a “schedule”. There are daily intentions to set the day and each day is defined. 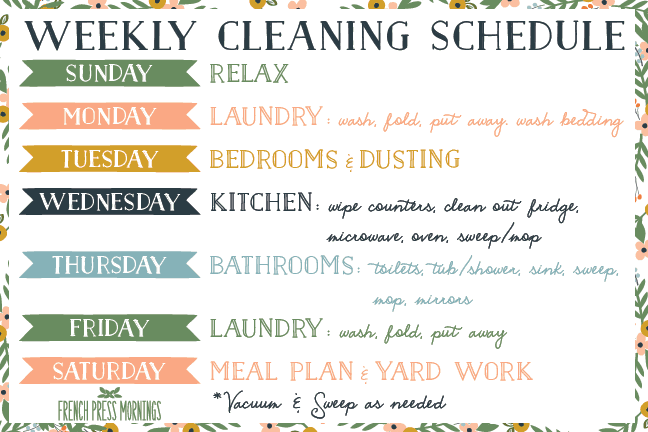 This Weekly Cleaning Schedule is very specific and I love how they are detailed about the days, like “dusting day” which I need so badly! 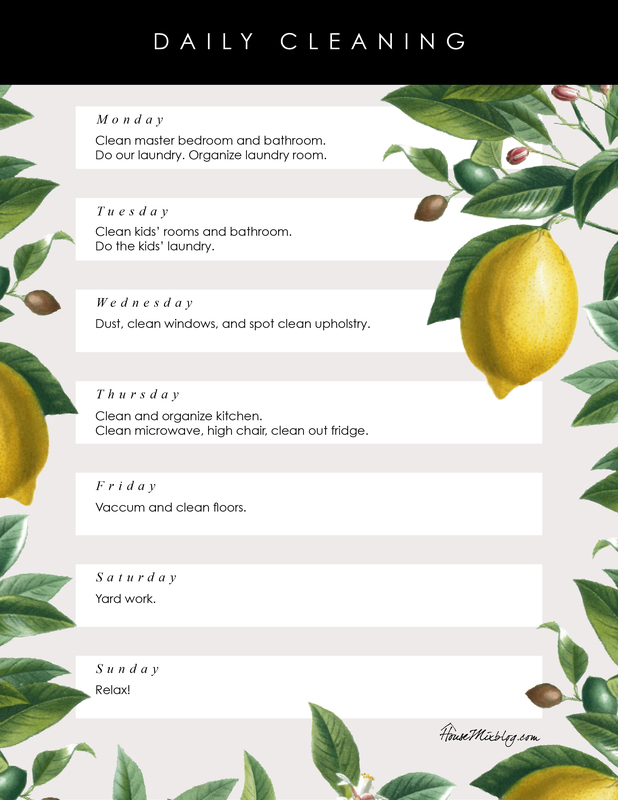 This is such a pretty cleaning schedule to print out and it’s beautiful that it starts with Sunday: Relax, my perfect type of schedule. I also really like how it is divided into “rooms” or “areas”. It’s ideally how I like to clean. This is probably my most favorite printable. It’s just so pretty and I love the lemons which make me think of fresh, clean laundry. It’s also very specifically for people with kids which I need in my life, clean kids rooms, yes! 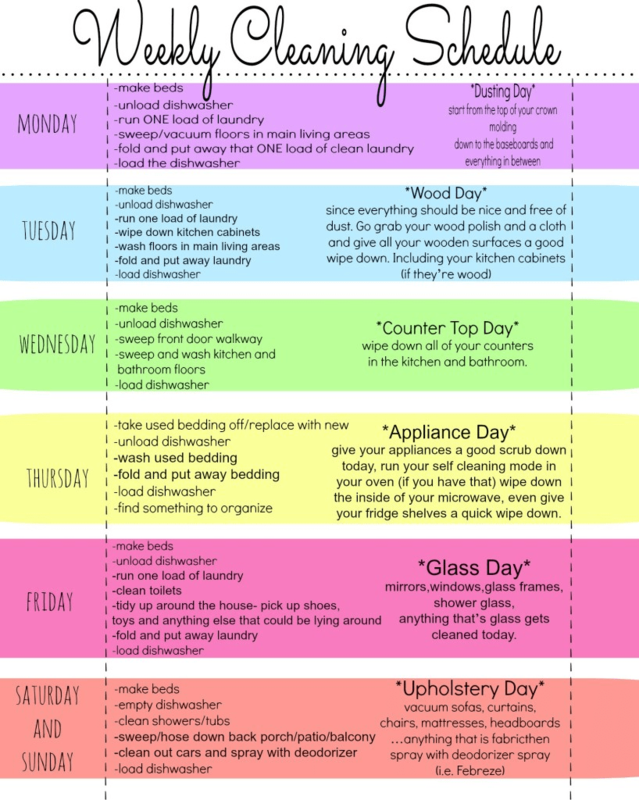 This is a really pretty and very practical cleaning schedule. 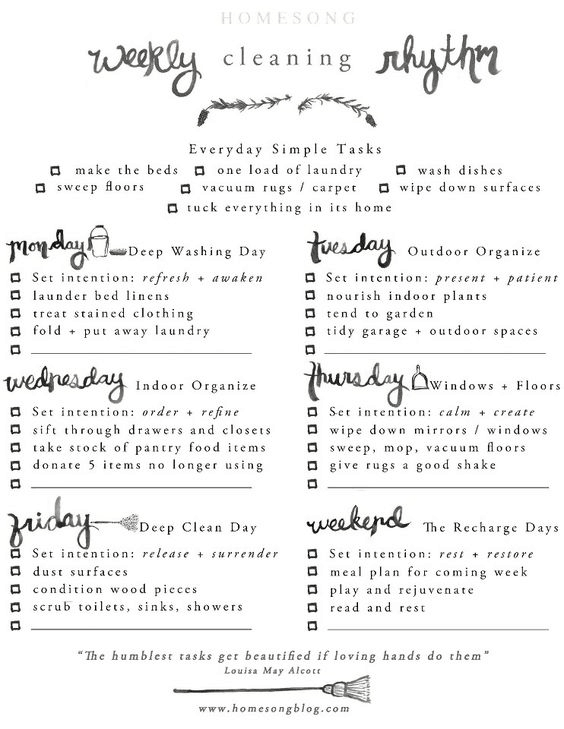 I love how it is broken down into seasonal, monthly and daily tasks. Super easy to see and work on. Also, it’s really simple and sometimes that’s all we need. Cleaning isn’t rocket science, it’s just hard to do when we are busy and life overtakes us. 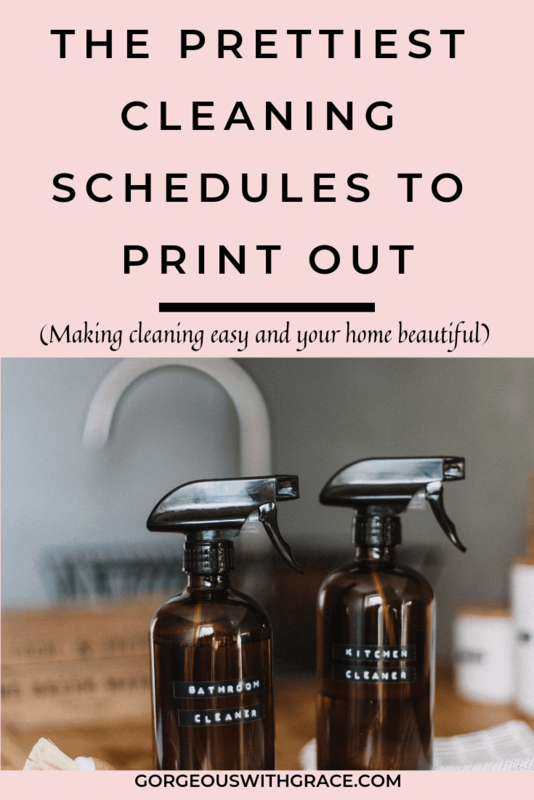 Let me know which one of these printables is your favorite or if you have any tips to keep our homes clean and simplified.